To provide the ultimate off season small sided game environment for youth soccer players to continue to develop and enhance their technical skills and tactical understanding of the game. Futsal Wichita provides the opportunity for players and coaches to compete in the only version of indoor soccer affiliated with FIFA, the US Soccer Federation and all major soccer federations around the world. Focusing on skill development and creative play. Matching teams of similar skill in appropriate divisions and age groups. Providing equal opportunity for the top teams to compete in the USYF Regional & National Championships. Exposing top players to the USYF Regional & National I.D. Camps for selection to youth national teams. Encouraging participation from all the Kansas club teams to showcase their diverse styles of play. Futsal Wichita will be housed at the 104,000 square foot Wichita Hoops Premier Athletic Facilty. Located in Bel Aire, Kansas at 53rd street north and Webb road, it has 3 regulation size Futsal courts and many more amenities to offer. Teams will enjoy the big game atmosphere that this facility provides. The viewing mezzanine, courtside seating, concession stands and exquisite building layout will provide players, coaches and spectators with a great Futsal experience. 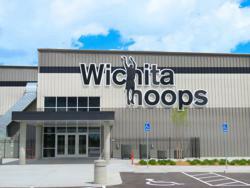 Visit www.wichitahoops.com for more information about our host facility.